I did my A-levels at an old-fashioned grammar school in Bavaria, moved to Hamburg to become a librarian and ended up in London working for the British Film Institute and British Airways. I come from a large family and now have three labradoodles as child substitutes with my partner. My new book “Conditions” will be out on October 16th. It is a contemporary novel about friends, family, mental health and a funeral. I published three historical novels but after my last novel, “Time To Let Go” (a book about Alzheimer’s), was surprisingly popular I decided to follow with another contemporary book. Five years ago I tried to write a handbook for a workshop and whilst I sat at the computer, I wrote down a short story, just to see if I could write fiction. To my surprise the short story turned into a novel and suddenly I had ideas for another. I wrote a few before I decided to publish one of them, “The Luck of the Weissensteiners” in late 2012. 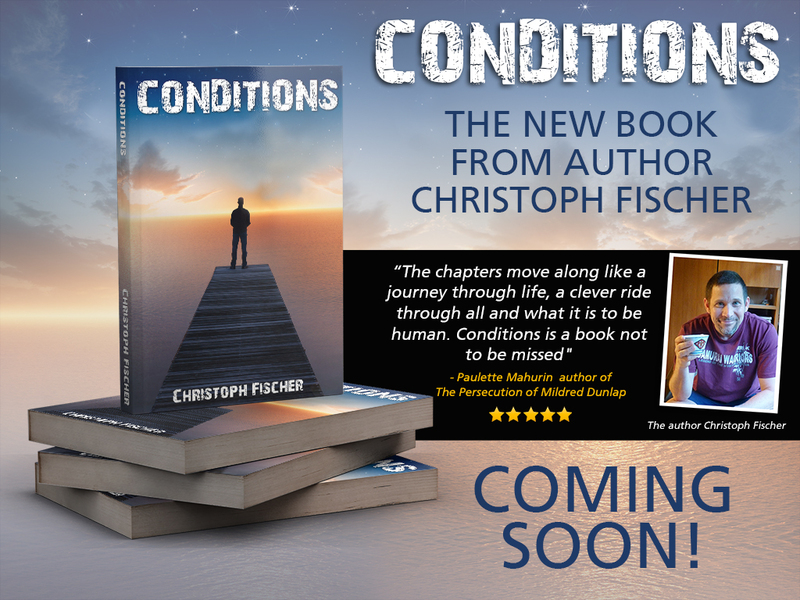 My new book, “Conditions” will be my fifth published book but it originated from the very first ‘short story’ I wrote and is my ‘original’ first book. A key scene in “Conditions” is a funeral, which is based on one I personally attended. The family division at a moment of grief shocked me and I always wanted to know more about it, although I never found out. It inspired the central conflict in the book. On a wider scale, I grew up in an environment where I felt I didn’t fit in and consequently, I always ended up being friends with other misfits; that has influenced the people that populate “Conditions”. I tend to write the first draft with a plotline in mind but characters and events take on their own life, so I also become part spectator as the story unfolds. Intuitively. I kept thinking of names but none of them fitted. Then “Conditions” popped into my mind and I liked it. I gradually realized how well it worked. 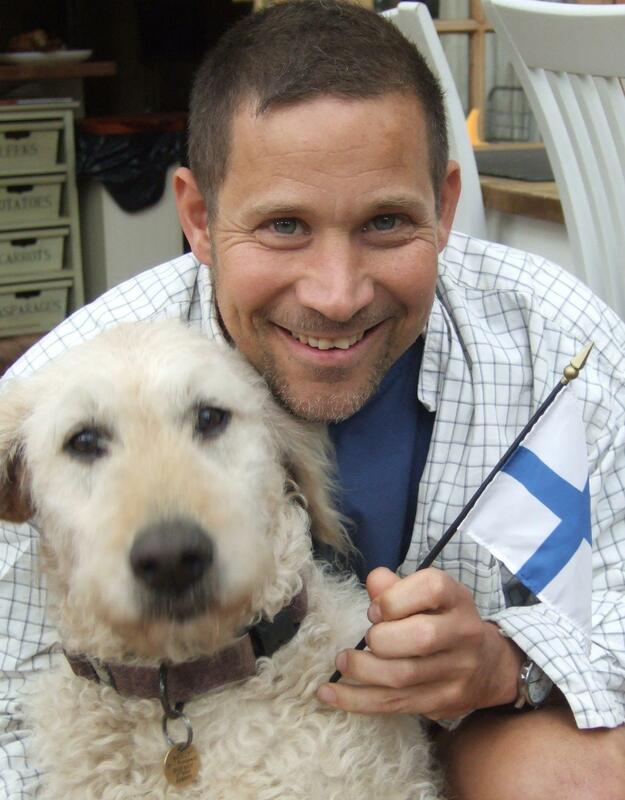 “In Search of a Revolution”, a historical novel set in Scandinavia between 1918 and 1850. It is about two Danish men whose friendship is tested by war, politics and love. My partner Ryan whose patience and kindness puts most of us to shame. I am starting to see it a bit like that but I am enjoying the experience so much that I know I will always write, even if I ever grow tired of publishing and marketing. I learned a lot from feedback, critical reviews and from continuously writing, so part of me is always tempted to go back over old material with an editing pen. However, I am not sure I would change more than minor details. I know if someone edited one of my favorite books I might be quite upset about it. She nodded slightly, hesitantly stepped into the hallway and looked searchingly around. Martha shrugged and gave a little grin, then stood there waiting for Simon to do something. “You have been here before, haven’t you?” he asked surprised at her lack of initiative. “Yes, of course,” she said, continuing to stand until he started to walk. Only then did she move towards the living room, following his lead. She sat down on the sofa, put her handbag on the floor and folded her hands over her knees. She remained that way, without saying a further word, her gaze averted towards the floor. Simon sat down on the other sofa and tried to think of the right thing to say, but was stumped. Although she was as shy as Charles had predicted, there was something quite forceful underneath that exterior that didn’t sit comfortable with him. An unspoken pressure surrounded that woman and tensed up the atmosphere. She, too, had very attractive features, he thought. A hint of Meg Ryan maybe, if only her face was more relaxed. “Can I get you a drink?” he eventually asked, grateful that something had finally sprung to mind. “No thank you,” she said, her voice cracking halfway through the first syllable. He noticed that her eyes were melancholic and seemed to be continually searching for something. She smiled and shrugged as if to apologise for it. Only then did Simon remember being told about her drinking problem and felt the sting of embarrassment. To add to his discomfort Martha now seemed to have lost some of her initial shyness and looked expectantly at him. The mounting pressure began to feel very uncomfortable. He remembered her story vaguely from one of Charles’s long monologues. Martha and Charles had met in hospital after his accident at the estate while she was being treated for nasty bruises and fractures – souvenirs from a recent fight with her latest abusive husband. The memory made him even more self-conscious as to what to speak to her about. “How was the journey?” Simon had finally thought to ask. “Alright,” she said, repeating her grin and shrug routine. “Are you still living in…” Simon paused, realising that he couldn’t remember the name of the town. “I’m still in the same place that I lived in with my ex-husband Clive,” she said eagerly. She had moved to the front of the seat and was leaning towards him. “It has to be sold to complete the divorce settlement and the sale is taking its time,” she added. “Sorry to hear that,” he said, surprised by her sudden change of attitude. “Like our marriage, the sale has turned into a tedious and painful affair,” she said, giggling slightly. “I don’t mind talking about it,” she said. “I’m in AA and there we share everything. Clive and I worked at the same firm and nothing about the split has ever been secret. Everyone knows my story and in parts I find that quite liberating. Charles probably mentioned the saga to you. At least he probably told you why I don’t drink,” she added. Simon was stunned into silence by her forwardness. “You don’t have to get embarrassed,” she assured him. “I am embarrassed,” he said, to which she just shrugged her shoulders. On the bus she couldn’t resist her curiosity and opened the text from Clive, bracing herself for another huge blow. Had he taken the house off the market yet again or was it going to be some regular abuse he often sent her when he was out drunk with his mates? Martha head was throbbing. Was this a hoax… a sick joke? What on earth was he playing at? She wanted to reply “I miss you, too” which would have been wrong … probably. And what if it was his girlfriend playing a prank? She shouldn’t reply at all. Ignore it. Leave him be. She opened her book and tried to focus on it. She couldn’t retain a single word she was reading. “I miss you!” “I miss you!” echoed over and over in her head. When was she ever going to beat her addiction to him? It was ridiculous to think that only half an hour ago a semi-naked hunk had woken her up and it had not stirred her sexual appetite, yet a text from her abusive ex-husband did. When was the whole nightmare ever going to end – one way or another? What did he want now? She had to know, so she put the book down, got her phone out and started to compose a text. “Dear Clive…” She deleted the ‘dear’ in case it would make the text sound too familiar or make her sound too soft. “What do you want?” she tried, then she deleted that as well. She didn’t want to appear too aggressive in case it would trigger a nasty reply. That was good. He could make of that what he wanted. After all, his text had not only come like a bolt from the blue, it had been inconclusive… a testing of the waters, without giving anything away himself. She would, as usual, come running and open her heart to him, and he could then decide if he wanted her or not without having made one single promise. Could he really be thinking about her? Did he want her back? Had his little child girlfriend become too boring or bored herself? Was it like Elaine had foretold? Clive had volatile moods and could easily change his mind again and make her look like a fool if her reply was too positive. Her “??? ?” was good, it did not give anything away and, maybe this once, she could have the upper hand in this relationship. She pressed send and immediately regretted it, tormented by worry and fear. She stared at her phone waiting for an instant reply – despite her better knowledge of Clive’s elusive phone manners. She got to the end of her journey and changed onto another bus. Still no reply. She worried now that she’d made a fool of herself. If he had texted her last night while being drunk, he probably didn’t even remember sending the message. She should have ignored it after all. What an idiot she was when it came to dealing with this man. By the time Martha got home she was in a hysterics over it. Of course there were no more texts from Clive. Instead there was a message on her home answer machine from the estate agent saying that there was going to be an extra viewing later that day and could she make sure the place was as presentable as possible. She had left the place in as good a state as she could, all she could do now was to take her bag and hide it under the bed. Probably best to leave the flat for the afternoon. A hysterical owner was not going to help sell the place – if it ever came to that. Then again, she’d only just arrived and it would be great to be at home at least for a little while. She would be careful not to make a mess and just have a quick coffee in the kitchen. Her mobile phone bleeped twice, telling her she had a text message. Her heart started to race. At last, word from her daughters. If this constant waiting for a message from Clive was going to continue Martha might well have a heart attack by the end of the day. She scolded herself for not really caring much about the message from the girls. She usually would have been worried about them the whole morning. Today, all she could think of was Clive. What a bad mother she had become. “Don’t you think it’s comforting that Henry died a happy and loved man?” Sarah asked. “No idea,” Ruth answered. “It said in the newspaper that she died after a long illness, so I guess it was either her blood disease or maybe cancer? I can ask around if you want to know. I really don’t think you should take too much interest in it, you’ll get carried away. Are you not angry at Charles at all?” asked Ruth. “I never really was that angry with him. Everything that happened must have been a tremendous shock for Charles. He’s such a sensitive soul. First Henry dying so sudden and then he got burnt and needed to go into hospital,” Sarah had to fight back tears which she didn’t want Ruth to see. She stood up and walked towards the bookshelves until she realised that she was in front of her secret chocolate stash and, feeling self-conscious, she quickly returned to her seat. “We’ve been through this before,” Ruth said with surprising warmth and implied understanding but still standing with her back to her mother. She was staring over the estate… the estate that would be hers one day. “Oh mother you can be so incredibly naïve,” she said laughing gently. “They were drunk, that’s all it was. I thought it was rather common, if I’m honest with you. The way Henry threw half of his tuxedo on the floor. They were drunk and full of lust, not love. Gay men have such an incredible sexual appetite, and your son was no exception, I’m sure. That’s why they bear the brunt of HIV and other sexually transmitted diseases. Don’t get me wrong, I’ve got a very good gay friend at my stables and have nothing against them as a group. You still have to be honest and call a spade a spade,” Ruth said with conviction. “You can be so mean and cynical!” countered her mother. “And you can be so naïve it hurts to watch.” Ruth turned slowly towards Sarah and put her hand on her arm. Continuity, not the big things like the time line and general events, but the tiny little details you make up while focusing on a different matter. Hair color of a secondary character, car type, etc. Lionel Shriver and Christos Tsiolkas, both for their raw honesty and uncompromising writing. Not yet, but I did go to the London Book Fair this year and am planning to attend a few more in the future, now that I know how it all works. All my covers were designed by Daz Smith of nethed.com and I must say he is a wizard. 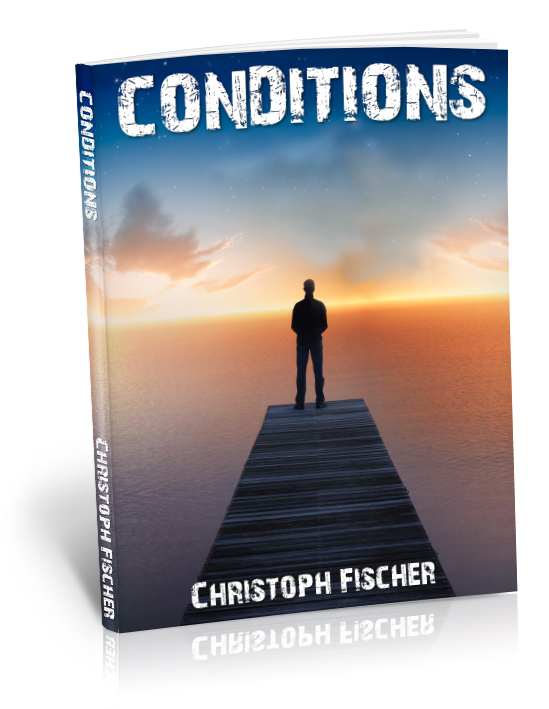 “Conditions” was my first book and had all the usual ‘first book’ errors, such as repetition and over-emphasizing my points, or including viewpoints that have nothing to do with the story. I found myself in almost all the characters I wrote, in one way or another. In that respect writing is a sometimes uncomfortable look in the mirror but it can also be liberating and very cathartic. I learned a lot of personal lessons. Yes. Write as much as you can because only practice makes perfect. And don’t get knocked down by criticism. Take from it what helps and keep going. Reviews are important to writers. If you have taken the time to read a book, consider leaving a comment on the website where you bought it. Independent writers in particular live from word of mouth and benefit from any fuss made about them. Remember that we do not have a big PR machine behind us, so if you liked a book you can make a big difference by just writing a few lines about it. It was called Konrad and was about a boy who came out of a tin. Apart from that, I grew up with Enid Blyton, Astrid Lindgren and Ottfried Preussler. Grown up books: “The Idiot” by Dostoyevsky and “Heimatmuseum” by Siegfried Lenz. Comedy TV, such as: Scrubs, Friends and Six Feet Under. My friends. Writers: Ian Hutson, Duncan Whitehead and Aaron David. Fiona: Is there one person past or present you would like to meet and why? Swedish author Henning Mankell seems a fascinating character with all the theatre and charity work he is doing aside his writing. Dead: My grandfather on my father’s side, who lived on the other side of the iron curtain and whom I never got to meet. Walking my dogs, cycling, running, travelling and films. Fiona: Do you have a blog/website? Christoph worked for the British Film Institute, in Libraries, Museums and for an airline. ‘The Luck of The Weissensteiners’ was published in November 2012; ‘Sebastian’ in May 2013 and The Black Eagle Inn in October 2013. In May 2014 he published his first contemporary novel “Time To Let Go” in May. He has written several other novels which are in the later stages of editing and finalisation. Terrific interview! Such an interesting bit of background about Christoph and his great books. Thanks, Fiona! Great interview. It’s nice to learn more about Christoph’s background and influences. He’s such a prolific writer and a real help to other authors out there. Thank you for the nice comments and thanks again Fiona for honouring me with such a comprehensive feature.